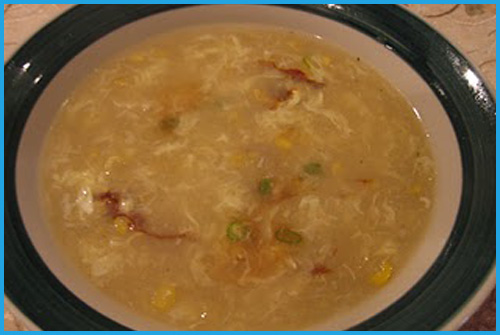 delicious sweet-corn soup its yumm! Cook the chicken with salt and water till cooked. Cool it and shred in long strips with hands. In a pan combine all the ingredients except cornflour,eggs and soy sauce. Bring it to a boil for 10-15 minutes. Mix cornflour with 1/4 cup cold water and pour into soup,mix well. add the egg whites slowly in hot soup from a height. add soya sauce and adjust the seasoning.